If you thought the reason the New York Jets had such a "bad" season last year was because 2011 was the year the lunacy of the Rex Ryan age — the foot videos, the Mark Sanchez "scandals," the "Hard Knocks" — caught up with them, the year the off-field overshadowed the on-field ... man, you ain't seen nothing yet. 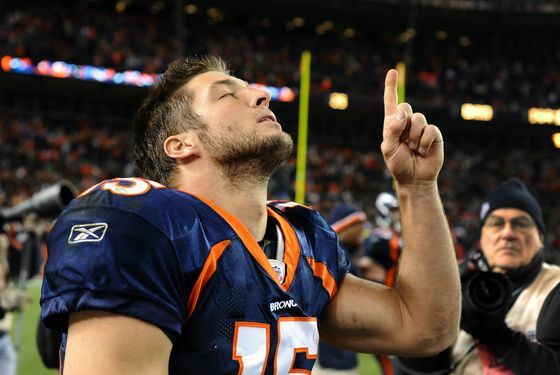 Tim Tebow is coming to town. The news just broke: The Jets have traded a fourth-round pick in the upcoming draft — essentially, peanuts — for the sainted Broncos quarterback, who became expendable when the Broncos signed Peyton Manning. So, out of nowhere, the most popular (and controversial, and godly, and exhausting, and just-about-everything) player in NFL, is a member of the Jets. Those New York Jets. The Jets of Rex Ryan. The Jets of Mark Sanchez. The freaking New York Jets. OK: Now Linsanity is over. Strap in, folks. You thought the Jets were a traveling roadshow of craziness since Rex Ryan got here? You ain't seen nothing yet.